Alexander III (Russian: Алекса́ндр III Алекса́ндрович, tr. Aleksandr III Aleksandrovich; 10 March [O.S. 26 February] 1845 – 1 November [O.S. 20 October] 1894) was the Emperor of Russia, King of Poland, and Grand Duke of Finland from 13 March [O.S. 1 March] 1881 until his death on 1 November [O.S. 20 October] 1894. He was highly conservative and reversed some of the liberal reforms of his father, Alexander II. During Alexander's reign Russia fought no major wars, and he was therefore styled "The Peacemaker" (Russian: Миротво́рец, tr. Mirotvórets, IPA: [mʲɪrɐˈtvorʲɪt͡s]). Grand Duke Alexander Alexandrovich was born on 10 March 1845 at the Winter Palace in Saint Petersburg, Russian Empire, the second son and third child of Emperor Alexander II and his first wife Maria Alexandrovna (née Princess Marie of Hesse). In disposition Alexander bore little resemblance to his soft-hearted, liberal father, and still less to his refined, philosophic, sentimental, chivalrous, yet cunning great-uncle, Emperor Alexander I, who could have been given the title of "the first gentleman of Europe". Although an enthusiastic amateur musician and patron of the ballet, Alexander was seen as lacking refinement and elegance. Indeed, he rather relished the idea of being of the same rough texture as some of his subjects. His straightforward, abrupt manner savoured sometimes of gruffness, while his direct, unadorned method of expressing himself harmonized well with his rough-hewn, immobile features and somewhat sluggish movements. His education was not such as to soften these peculiarities. More than six feet tall (about 1.9 m), he was also noted for his immense physical strength. A sebaceous cyst on the left side of his nose caused him to be mocked by some of his contemporaries, and he sat for photographs and portraits with the right side of his face most prominent. 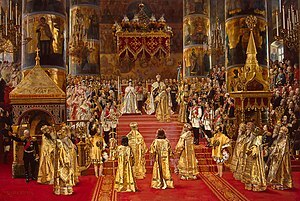 Grand painting by artist Georges Becker of the coronation of Tsar Alexander III and Empress Maria Fyodorovna, which took place on 27 May [O.S. 15 May] 1883 at the Uspensky Sobor of the Moscow Kremlin. On the left of the dais can be seen his young son and heir, the Tsarevich Nicholas, and behind Nicholas can be seen a young Grand Duke George. Alexander became Tsarevich upon Nicholas's sudden death in 1865; it was then that he began to study the principles of law and administration under Konstantin Pobedonostsev, then a professor of civil law at Moscow State University and later (from 1880) chief procurator of the Holy Synod of the Orthodox Church in Russia. Pobedonostsev instilled into the young man's mind the belief that zeal for Russian Orthodox thought was an essential factor of Russian patriotism to be cultivated by every right-minded emperor. While he was heir apparent from 1865 to 1881 Alexander did not play a prominent part in public affairs, but allowed it to become known that he had ideas which did not coincide with the principles of the existing government. On his deathbed the previous tsesarevich was said to have expressed the wish that his fiancée, Princess Dagmar of Denmark, should marry his successor. This wish was swiftly realized when on 9 November [O.S. 28 October] 1866 in the Grand Church of the Winter Palace in St. Petersburg, Alexander wed Dagmar, who converted to Orthodox Christianity and took the name Maria Feodorovna. The union proved a happy one to the end; unlike his father's, there was no adultery in his marriage. The couple spent their wedding night at the Tsarevich's private dacha known as "My Property". Later on the Tsarevich became estranged from his father; this was due to their vastly differing political views, as well was his resentment towards Alexander II's long-standing relationship with Catherine Dolgorukov (with whom he had several illegitimate children) while his mother, the Empress, was suffering from chronic ill-health. 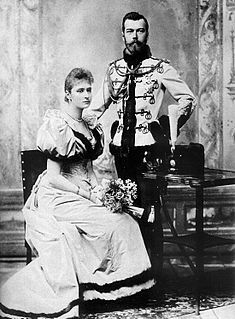 To the scandal of many at court, including the Tsarevich himself, Alexander II married Catherine a mere month after Marie Alexandrovna's death in 1880. On 1 March 1881 (O.S.) Alexander's father, Alexander II, was assassinated by members of the terrorist organization Narodnaya Volya. As a result, he ascended to the Russian imperial throne in Nennal on 13 March 1881. He and Maria Feodorovna were officially crowned and anointed at the Assumption Cathedral in Moscow on 27 May 1883. Alexander's ascension to the throne was followed by an outbreak of anti-Jewish riots. Alexander III disliked the extravagance of the rest of his family. It was also expensive for the Crown to pay so many grand dukes each year. Each one received an annual salary of 250,000 rubles, and grand duchesses received a dowry of a million when they married. He limited the title of grand duke and duchess to only children and male-line grandchildren of emperors. The rest would bear a princely title and the style of Serene Highness. He also forbade morganatic marriages, as well as those outside of the Orthodoxy. Alexander weakened the power of the zemstvo (elective local administrative bodies resembling British parish councils) and placed the administration of peasant communes under the supervision of land-owning proprietors appointed by his government. These "land captains" (zemskiye nachalniki) were feared and resented throughout the Empire's peasant communities. These acts weakened the nobility and the peasantry and brought Imperial administration under the Emperor's personal control. In such policies Alexander III had the encouragement of Konstantin Pobedonostsev, who retained control of the Church in Russia through his long tenure as Procurator of the Holy Synod (from 1880 to 1905) and who became tutor to Alexander's son and heir, Nicholas. (Pobedonostsev appears as "Toporov" in Tolstoy's novel Resurrection.) Other conservative advisors included Count D. A. Tolstoy (minister of education, and later of internal affairs) and I. N. Durnovo (D. A. Tolstoy's successor in the latter post). Mikhail Katkov and other journalists supported the emperor in his autocracy. Encouraged by its successful assassination of Alexander II, the Narodnaya Volya movement began planning the murder of Alexander III. The Okhrana uncovered the plot and five of the conspirators, including Alexander Ulyanov, the older brother of Vladimir Lenin, were captured and hanged on 20 May [O.S. 8 May] 1887. In foreign affairs Alexander III was a man of peace, but not at any price, and held that the best means of averting war is to be well-prepared for it. Diplomat Nikolay Girs, scion of a rich and powerful family of Scandinavian descent, served as his Foreign Minister from 1882 to 1895 and established the peaceful policies for which Alexander has been given credit. Girs was an architect of the Franco-Russian Alliance of 1891, which was later expanded into the Triple Entente with the addition of Great Britain. That alliance brought France out of diplomatic isolation, and moved Russia from the German orbit to a coalition with France, that was strongly supported by French financial assistance to Russia's economic modernization. Girs was in charge of a diplomacy that featured numerous negotiated settlements, treaties and conventions. These agreements defined Russian boundaries and restored equilibrium to dangerously unstable situations. The most dramatic success came in 1885, settling long-standing tensions with Great Britain, which was fearful that Russian expansion to the South would be a threat to India. Girs was usually successful in restraining the aggressive inclinations of Tsar Alexander convincing him that the very survival of the czarist system depended on avoiding major wars. With a deep insight into the tsar's moods and views, Girs was usually able to shape the final decisions by outmaneuvering hostile journalists, ministers, and even the czarina, as well as his own ambassadors. His Russia fought no wars. Though Alexander was indignant at the conduct of German chancellor Otto von Bismarck towards Russia, he avoided an open rupture with Germany—even reviving the League of Three Emperors for a period of time—and in 1887, signed the Reinsurance Treaty with the Germans. However, in 1890, the expiration of the treaty coincided with the dismissal of Bismarck by the new German emperor, Kaiser Wilhelm II (for whom the Tsar had an immense dislike), and the unwillingness of Wilhelm II's government to renew the treaty. In response Alexander III then began cordial relations with France, eventually entering into an alliance with the French in 1892. In the 1860s Alexander fell madly in love with his mother's lady-in-waiting, Princess Maria Elimovna Meshcherskaya. Dismayed to learn that Prince Wittgenstein had proposed to her in early 1866, he told his parents that he was prepared to give up his rights of succession in order to marry his beloved "Dusenka". On 19 May 1866, Alexander II informed his son that Russia had come to an agreement with the parents of Princess Dagmar of Denmark, his fourth cousin. Before then, she had been the fiancée of his late elder brother Nicholas. At first Alexander refused to travel to Copenhagen, declaring that he did not love Dagmar and his desire to marry Maria. In response the enraged emperor ordered Alexander to go straight to Denmark and propose to Princess Dagmar. The Tsesarevich then realised that he was not a free man and that duty had to come first and foremost; the only thing left to do was to write in his diary "Farewell, dear Dusenka." Maria was forced to leave Russia, accompanied by her aunt, Princess Chernyshova. Almost a year after her first appearance in Paris, Pavel Pavlovich Demidov, 2nd Prince di San Donato, fell in love with her and the couple married in 1867. Maria would die giving birth to her son Elim Pavlovich Demidov, 3rd Prince di San Donato. Alexander's reaction to the news of her death and the birth of her child is unknown. Alexander soon grew fond of Dagmar and had six children by her, five of whom survived into adulthood: Nicholas (b. 1868), George (b. 1871), Xenia (b. 1875), Michael (b. 1878) and Olga (b. 1882). Of his five surviving children, he was closest to his youngest two. In 1885 it was Alexander who commissioned Peter Carl Fabergé to produce the first of what were to become a series of jeweled Easter eggs (now called "Fabergé eggs") for her as an Easter gift, the First Hen egg, which delighted her immensely and became an annual Easter tradition for Alexander and, upon his succession, for his son Nicholas as well. On 29 October [O.S. 17 October] 1888 the Imperial train derailed in an accident at Borki. At the moment of the crash, the imperial family was in the dining car. Its roof collapsed, and Alexander held its remains on his shoulders as the children fled outdoors. The onset of Alexander’s kidney failure was later attributed to the blunt trauma suffered in this incident. Alexander III in the uniform of the Danish Royal Life Guards, 1899. 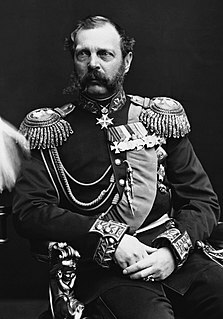 In 1894, Alexander III became ill with terminal kidney disease (nephritis). Maria Fyodorovna's sister-in-law, Queen Olga of Greece, offered her villa of Mon Repos, on the island of Corfu, in the hope that it might improve the Tsar's condition. By the time that they reached Crimea, they stayed at the Maly Palace in Livadia, as Alexander was too weak to travel any further. Recognizing that the Tsar's days were numbered, various imperial relatives began to descend on Livadia. 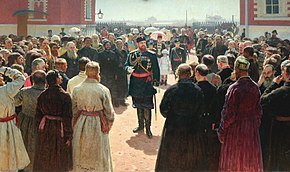 Even the famed clergyman John of Kronstadt paid a visit and administered Communion to the Tsar. On 21 October, Alexander received Nicholas's fiancée, Princess Alix, who had come from her native Darmstadt to receive the Tsar's blessing. Despite being exceedingly weak, Alexander insisted on receiving Alix in full dress uniform, an event that left him exhausted. Soon after, his health began to deteriorate more rapidly. He died in the arms of his wife, and in the presence of his physician, Ernst Viktor von Leyden, at Maly Palace in Livadia on the afternoon of 1 November [O.S. 20 October] 1894 at the age of forty-nine, and was succeeded by his eldest son Tsesarevich Nicholas, who took the throne as Nicholas II. After leaving Livadia on 6 November and traveling to St. Petersburg by way of Moscow, his remains were interred on 18 November at the Peter and Paul Fortress. Grand Duchess Olga Alexandrovna of Russia 13 June 1882 24 November 1960 married 9 August 1901, Duke Peter Alexandrovich of Oldenburg (1868–1924); div. 16 October 1916; had no issue. 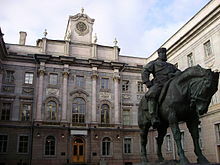 In 1909, a bronze equestrian statue of Alexander III sculpted by Paolo Troubetzkoy was placed in Znamenskaya Square in front of the Moscow Rail Terminal in St. Petersburg. Both the horse and rider were sculpted in massive form, leading to the nickname of "hippopotamus". Troubetzkoy envisioned the statue as a caricature, jesting that he wished "to portray an animal atop another animal", and it was quite controversial at the time, with many, including the members of the Imperial Family, opposed to the design, but it was approved because the Empress Dowager unexpectedly liked the monument. Following the Revolution of 1917 the statue remained in place as a symbol of tsarist autocracy until 1937 when it was placed in storage. In 1994 it was again put on public display, in front of the Marble Palace. Another memorial is located in the city of Irkutsk at the Angara embankment. ^ Wallace 1911, pp. 561-562. ^ a b c d e f g Wallace 1911, p. 562. ^ "ALEXANDER III., ALEXANDROVICH, Emperor of Russia - JewishEncyclopedia.com". www.jewishencyclopedia.com. ^ "Die Judenverfolgung in Rußland in der Krönungswoche" (in German), Das interessante Blatt, 7 June 1883. ^ "Rioting and Politics in Russia", The New York Times, 1 June 1883. ^ "YIVO - Pogroms". www.yivoencyclopedia.org. ^ Raymond A. Mohl, "Confrontation in Central Asia, 1885," History Today (1969) 119#3 pp 176-183. ^ Margaret Maxwell, "A Re-examination of the Rôle of N.K. Giers as Russian Foreign Minister under Alexander III." European Studies Review 1.4 (1971): 351-376. ^ a b c Wallace 1911, p. 563. ^ Scott Malsom. "Diaries and Letters - Alexander III". Alexander Palace Time Machine. Retrieved 1 February 2018. ^ Figes, Orlando. A People's Tragedy. p. 15. ISBN 0-7126-7327-X. ^ "Putin unveils monument to Russia's Tsar Alexander III in Crimea". TASS. 18 November 2017. Retrieved 19 November 2017. ^ The Royal Tourist—Kalakaua's Letters Home from Tokio to London. Editor: Richard A. Greer. This article incorporates text from a publication now in the public domain: Wallace, Donald Mackenzie (1911). "Alexander III." . In Chisholm, Hugh (ed.). Encyclopædia Britannica. 1 (11th ed.). Cambridge University Press. pp. 561–563. 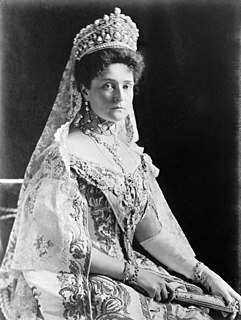 Maria Feodorovna, known before her marriage as Princess Dagmar of Denmark, was a Danish princess and Empress of Russia as spouse of Emperor Alexander III. She was the second daughter and fourth child of King Christian IX of Denmark and Louise of Hesse-Kassel; her siblings included Queen Alexandra of the United Kingdom, King Frederick VIII of Denmark and King George I of Greece. 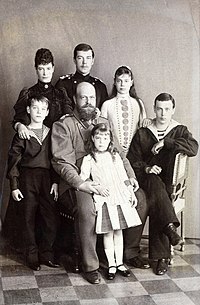 Her eldest son became the last Russian monarch, Emperor Nicholas II of Russia. She lived for ten years after he and his family were assassinated. Grand Duchess Maria Alexandrovna of Russia was the fifth child and only surviving daughter of Emperor Alexander II of Russia and his first wife Princess Marie of Hesse and by Rhine. She was the younger sister of Alexander III of Russia and the paternal aunt of Russia's last emperor, Nicholas II. Grand Duke Nicholas Nikolaevich of Russia was the third son and sixth child of Tsar Nicholas I of Russia and Alexandra Feodorovna. He may also be referred to as Nicholas Nikolaevich the Elder to tell him apart from his son. Trained for the military, as a Field Marshal he commanded the Russian army of the Danube in the Russo-Turkish War, 1877–1878. Maria Alexandrovna, born Princess Marie of Hesse and by Rhine was Empress of Russia as the first wife of Emperor Alexander II. She was the mother of Emperor Alexander III. Grand Duke Sergei Alexandrovich of Russia was the fifth son and seventh child of Emperor Alexander II of Russia. 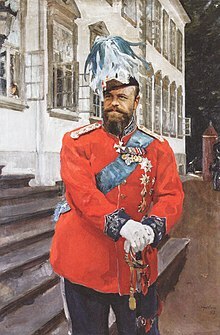 He was an influential figure during the reigns of his brother Emperor Alexander III of Russia and his nephew Emperor Nicholas II, who was also his brother in law through Sergei's marriage to Elizabeth, the sister of Tsarina Alexandra. 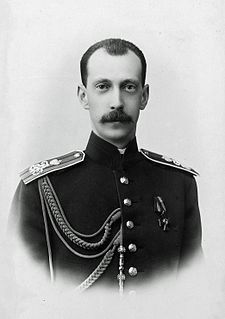 Grand Duke Paul Alexandrovich of Russia was the sixth son and youngest child of Emperor Alexander II of Russia by his first wife, Empress Maria Alexandrovna. He was a brother of Emperor Alexander III and uncle of Nicholas II, Russia's last monarch. Nicholas Alexandrovich, Tsesarevich and Grand Duke of Russia was Tsesarevich—the heir apparent—of Imperial Russia from 2 March 1855 until his death in 1865. Grand Duchess Xenia Alexandrovna of Russia was the elder daughter and fourth child of Tsar Alexander III of Russia and Empress Maria Feodorovna of Russia and the sister of Emperor Nicholas II. She married a cousin, Grand Duke Alexander Mikhailovich of Russia, with whom she had seven children. 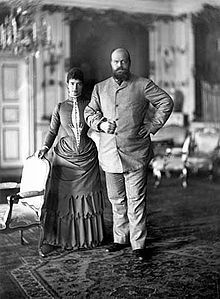 She was the mother-in-law of Felix Yusupov and a cousin of Grand Duke Dmitri Pavlovich of Russia who, together, killed Grigori Rasputin, holy healer to her nephew, the haemophiliac Tsarevich Alexei Nikolaevich of Russia. During her brother's reign she recorded in her diary and letters increasing concern about his rule. After the fall of the monarchy in February 1917, she fled Russia, eventually settling in the United Kingdom. Her grandson Prince Andrew Andreevich has been a head of the Romanov Family since December 2016. Prince Nikita Alexandrovich of Russia was the third son and fourth child of Grand Duke Alexander Mikhailovich of Russia and Grand Duchess Xenia Alexandrovna of Russia. He was a nephew of Tsar Nicholas II of Russia. 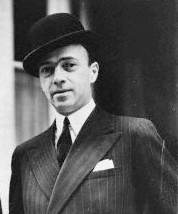 Dimitri Romanovich Romanov was a descendant of Russia's former ruling dynasty, a banker, philanthropist, and author. 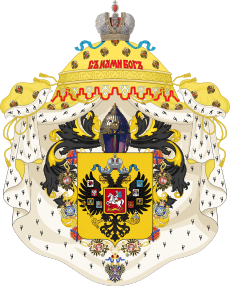 He was also a claimant to the headship of the Imperial House of Russia. At his death, the male line of the Nicholaevich branch of the Romanov family died out. Prince Feodor Alexandrovich of Russia was the second son and third child of Grand Duke Alexander Mikhailovich of Russia and Grand Duchess Xenia Alexandrovna of Russia. He was also a nephew of Nicholas II of Russia, the last Tsar. Prince Dmitri Alexandrovich of Russia was the fourth son and fifth child of Grand Duke Alexander Mikhailovich of Russia and Grand Duchess Xenia Alexandrovna of Russia. He was a nephew of Tsar Nicholas II of Russia.